English translation of a short review in Persian. In 1853, a new wave of persecutions was unleashed on the surviving Bábís. They took refuge in the mountains and again heroically defended themselves against overpowering forces. And this time the women participated, serving as lookouts and defending water supplies. The Bábís were eventually defeated. 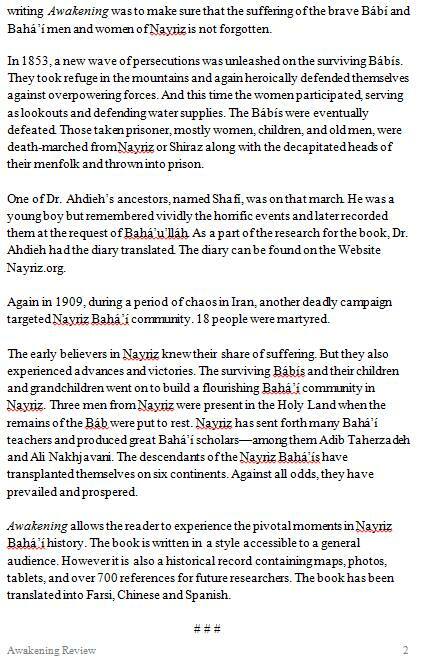 Those taken prisoner, mostly women, children, and old men, were death-marched from Nayriz or Shiraz along with the decapitated heads of their menfolk and thrown into prison. The early believers in Nayriz knew their share of suffering. But they also experienced advances and victories. The surviving Bábís and their children and grandchildren went on to build a flourishing Bahá’í community in Nayriz. Three men from Nayriz were present in the Holy Land when the remains of the Báb were put to rest. Nayriz has sent forth many Bahá’í teachers and produced great Bahá’í scholars—among them Adib Taherzadeh and Ali Nakhjavani. The descendants of the Nayriz Bahá’ís have transplanted themselves on six continents. Against all odds, they have prevailed and prospered. 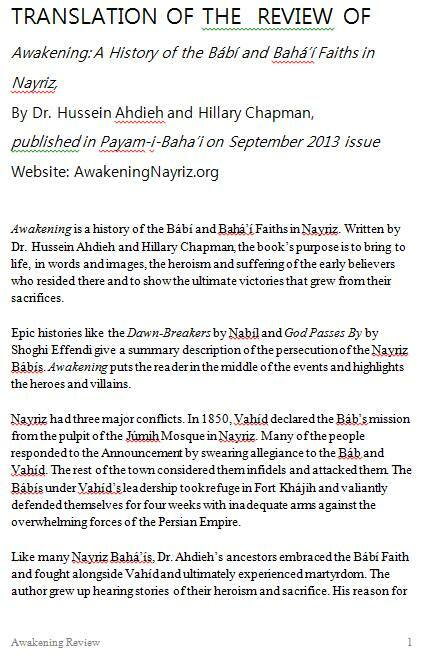 Awakening allows the reader to experience the pivotal moments in Nayriz Bahá’í history. The book is written in a style accessible to a general audience. However it is also a historical record containing maps, photos, tablets, and over 700 references for future researchers. The book has been translated into Farsi, Chinese and Spanish.